Salem has changed so dramatically since my husband and I moved here 6 years ago. I have already noted all the wonderful things that drew us to the community in the first place, yet the list of amenities that continue to make us sink our roots into Salem are growing every day. If I had to choose one thing that I’ve come to love the most about this city, I would have to say the geographic location. They used to say, “Salem? You can’t get there from here.” Now the commuter rail whisks folks to downtown Boston in a mere 35 minutes, and with the internet and so many people working from home at least for part of their work week – Who wants to leave? Every day when Dann and I stroll the the main streets of downtown with our pup, we feel like pinching ourselves and find ourselves saying, “We actually get live here!” We have greeted many New Year’s mornings bundled up, sipping coffee sitting at the base of the lighthouse at the end of Pickering Wharf. The harbor has become a favorite of Teo’s as well. He loves a quick dip on a hot day. At the end of the wharf you can stand with your back to the city and feel like you are in Mystic CT. Turn back around and you are in the very heart of a dynamically changing downtown that offers something for everyone from college kids to Baby Boomers, first time home buyers to down-sizers ready to reclaim “their time” after the kids have flown the coop! And for some strange reason there are a whole lot more rescued greyhounds in Salem since we adopted our boy! Teo has brought us out into nature much more and we have fallen in love with The Willows , Winter Island and the Salem Woods. I have lived in Boston, Cambridge and New York City – but no place offers what Salem’s got goin’ on! super dog friendly community (well-behaved pups are even allowed on the patio of the Lobster Shanty! I can not help but tip my hat to both Mayor Kim Driscoll as well as the Salem Partnership who have spearheaded most if not all the dramatic changes. (At the Partnership you will find recent and continuing projects slated to support the rejuvenation of Salem, including a plan for the Harbor which will draw small cruise ships to grace our beautiful harbor once again! 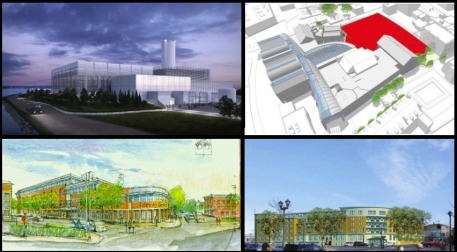 Today I thought I’d share with you a small peek at 5 projects that are changing the face of Salem. Footprint Power Station: At a meeting last month, the Salem Planning Board unanimously approved a long list of conditions pertaining to Footprint Power’s plan to convert the Salem Harbor Power Station into a state-of-the-art natural gas plant. Salem’s New MBTA Station: Construction on the $37 million station is expected to wrap up sometime in the winter of 2014, according to the presentation. The station will have a five-level garage with 690 spaces. $45M Dodge Street Development: A proposed $45 million downtown Salem development took a major step forward last month when city councilors unanimously approved the abandonment and sale of a small parcel of land at the intersection of Washington and Dodge streets. Salem’s New Community Life Center: Thanks to some last-minute compromises, Salem city councilors voted 10 to 1 earlier this year to approve a financing proposal from Mayor Kim Driscoll to pay for a new $4.5 million Community Life Center at the intersection of Boston and Bridge streets. $200M Peabody Essex Expansion: Earlier this month, officials at the Peabody Essex Museum issued a press release announcing the selection of Ennead Architects to design the museum’s $200 million, 175,000-square-foot expansion. If you would like to follow other recent or upcoming projects slated to rejuvenate Salem visit The Partnership. « DOs and DON’T to Make sure Your Loan Closes!